optoblog.com » Blog Archive » Colorblind? There’s an App for That. Colorblind? There’s an App for That. 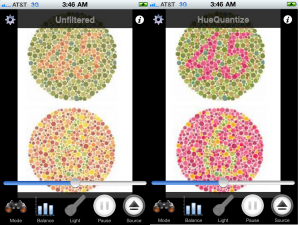 Dan Kaminsky created an iPhone & Android App for people with red-green color deficiencies. It exaggerates the hues after you take a picture on your app-phone. Wow! This sounds neat. I have two sons with this type of colorblindness. Thanks, Dan! That’s pretty fantastic – does it work for any photo that you take?